These skills are not dependent on your strength, your height and weight, so even a weak, ill or injured person, woman or child, can effectively use them. These skills are universal — they work in every environment and situation, against one or more adversaries, all kinds of edged weapons and handy objects. These skills minimize any trauma factors and enhance the adjustment of reserved potential of your body, due to the use of subconscious resources and extended perception of the space around you by all senses. If you wish to be able to control your mind (and fear) at all times when facing danger and have a solid skill foundation for it, then this message is very important for you. Not that long ago, some 20-30 years, it was only people of “special professions” who could undergo special training — subversives, intelligence agents, officers of special army forces and fleet, certain groups of law enforcement agencies. By today the world had changed so radically (and not for the better), that special training is not simply a necessity, but it’s a vital skill for any reasonable person. but due to the their character cannot give that specific level of training which anyone of us should have in order to survive in a variety of life situations the world is so full of today. …and the only chance to escape it safe and sound (or with minimum harm) is to undergo special training and acquire life-saving skills of personal safety technique. Even a simple familiarization with the materials is better than nothing. And if you know and are capable to do what we are teaching, you will excel 99% of the planet’s population in matters of self-safety guarantee, especially in extreme, stressful and injury-risk, situations. Let’s look at statistics (the one we can still trust). About 140 thousand of people in Russia die annually in accidents and emergency situations. The number of injured can be estimated as 1:10, that is a lot more. This makes 1% of the country’s population. It can be compared to the “results” of the Afghan war — about 2% of the overall number of people involved in military operations are dead. So Our Everyday Life Is “Only” 2 Times Less Dangerous In Comparison to the Warfare! that real extreme conditions are often a result of a combination of media. Which one of them will be a defying one is unpredictable. That is why you have to prepare for existence in all media, that is to study and single out the survival principles common for all these media. that the participants of this training attain in a matter of days are no miracle (even though it seems like it at first glance). On the contrary, they are the result of thought transformation. And the reason for this transformation is absolutely scientific, counter-intuitive thinking principles, that are 100% different from an average person’s way of thinking. together with the special movement skills training and psychophysical exercises – that’s how we get those prompt results. That’s why we claim that the Kadochnikov System differs radically from all existing martial arts and fighting techniques. Easy to access and master. How to Master the Special Skills of Personal Safety Technique? We're going to tell you a secret. Despite the fact that all the formats for specialized teaching and training according to our System are not randomly chosen and have objective reasons in their foundation, we still favor one of the formats more than the rest of them. We mean the format of 7-day training. We only organize it once a year. Normally in the city of Anapa. During these 7 days of training together with Arkadiy Alekseevich we manage to give full theoretical and practical material sufficient for the destruction of not only motive, but also thinking stereotypes even of our beginners. Special Home-Study Videotraining "7 Day Intensive Training"
It is done due to the fact that the 7-day training format allows us to move from the general principals of System’s functioning to specifics and their step-by-step analysis. Then go back to the general principals and notions. And then work on the details of certain case methods. Doing so during the whole 7 days of the training. Beginners learn fast, more experienced trainees (some of them visit the training each year) improve their skills and find the understanding of things they thought they knew and mastered on a deeper level. The number of people wishing to take part in our training grows with every year. We are no longer capable to enlist everyone. We have to arrange preliminary registration and decline those who didn’t register in advance. And as we don’t want to level up the admission price for this training, the number of those who can’t get there will be increasing with each year. That is why, exclusively for people who can study at home, we decided to issue a full video version of the 7-day training, held in Anapa in July 2011. The production was done on professional video equipment. So in order to film the whole training process in excellent quality we had to produce more than 15 hours of video. We believe that people who manage to receive these training materials, will consider the huge amount of work by our technical team to be worthy of their time and efforts. 80% of the training time is dedicated to the skill formation. Theory goes to the background (most of it is learned simultaneously with skill practicing). Each element is studied step-by-step and trained till you have a skill for its performance as an integral moving act, also in a stressful situation. Each element and combination is accompanied with detailed and step-by-step instruction that allow us to effectively use this material as a self-training guide at home or in a group of like-minded people. To develop and improve the body and mind resources in the right way, work efficiently in accordance with your own functional capabilities, that you possess at a certain time and in a certain place. We start with basics. Deep mastering of the opposite tack. We get to know the basics of stability theory and method of controlling the opponent, by moving his mass centre outside of the support area of his legs. We master the skill of minimizing any forced impact regardless of your opponents’ strength and speed. We master specially applied exercises for vital abilities formation that allow us to control our body in difficult circumstances. We learn to receive any blows of our opponent and divide their negative impact into components before they reach the target. We study the variations of impact ways depending on the initial cinematic situations. We get acquainted with work principals in unconventional situations and minimize the possibility of injury. 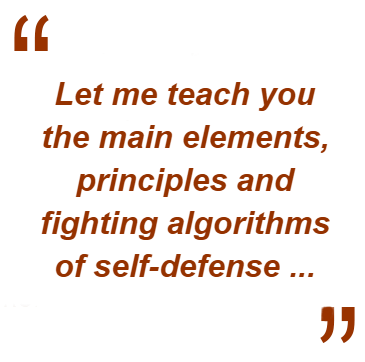 We study the algorithms which will allow us to use not more than 25% of our strength. By the end of the training you are likely to be surprised yourself how much you can benefit from it. Perhaps you couldn’t even dream about such progress. Sounds like an exaggeration? Simple facts. And we know it because we’ve been personally watching what results have been achieved by the students who have undergone special training for about half of the century — these people achieve real breakthroughs in their lives, all thanks to the System of personal safety technique. However, the way you’ll benefit from the program largely depends on your inner motivation and aspiration. We can only help you — give you knowledge, help to form your skills and abilities, familiarize you with certain information. That said, you can only get the most important things if you work with zeal. Your results are directly proportional to your efforts. You’ve started to conquer your fear. You’ve ventured to a bold and decisive act — to undergo a special training of personal safety technique. From now on we want you to think of yourself as the bravest person there is. The way you consider yourself is the way you’ll become. What stops you right now from feeling self-confidence and self-respect? Whether you are brave or not doesn’t depend on your surroundings. It depends on what’s going on inside of you. We are afraid of what we don’t know. Only knowledge and right thinking can give you courage, and only ignorance can cause fear. That is why you should start considering yourself as brave right now. And the materials of the special training course will provide all the necessary knowledge. 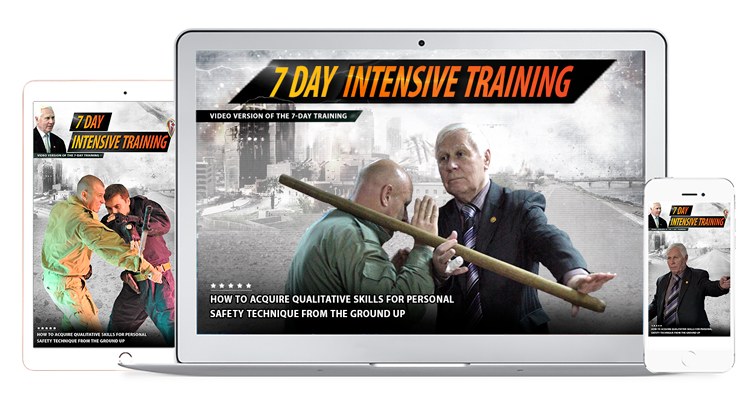 In addition to online course you will get exclusive bonus - 49 minutes videocourse "Knife Throwing. 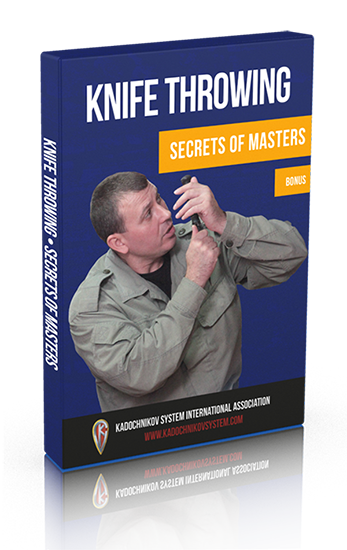 Secrets of Masters" which will teach you the knife throwing technique that we use in Kadochnikov System. What Will You Lose Without This Course? Of course you’re aware that your skills and abilities enhance your social importance and self-esteem, whereas ignorance causes problems. The definition of ignorance: “Lack of skills, abilities and knowledge”. All specialists, even the most qualified ones, learn something all the time … constantly trying to get more knowledge and improve their skills. We believe that if you are still reading this presentation, you are serious about your personal safety technique. The special training course is the result of many years of work in this field. If you find this knowledge useful at least once in your life, it will be repaid manifold. We believe you should know that the training participants paid the registration fee of $500. And it’s not all they had to pay for. The registration fee doesn’t include the travel costs to the location of the training, accommodation, meals and even the cost of “leaving your job”. Put it all together and it turns out that most of the training participants paid at least $1000 for their education. That’s right! You get your complete online version of this training. 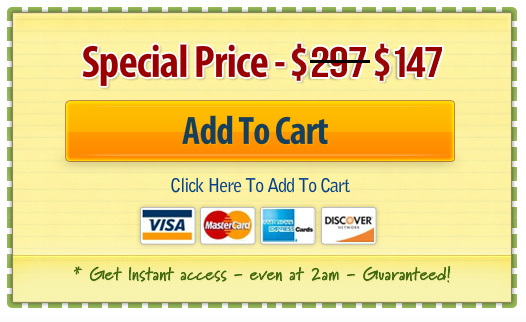 …investing only $147 in your knowledge that you’ll be proud of. Your satisfaction is, of course, 100% guaranteed. I will get access to the digital version of the video training consisting of 12 modules with the complete program of 7 day intensive training with total video duration of more than 15 hours, produced on high quality filming equipment. I’m not risking anything as I have more than 100% guarantee. If I won’t be able to master your special training program during the first 2 months I get a full refund. Without any questions or explanations. P.S. Now that you know how to acquire reliable skills of survival and personal safety technique use the advice given in our presentation … before it’s too late. P.P.S. After getting the training video “Kadochnikov System Seven Day Intensive Training” you’ll either acquire the priceless knowledge and recommendations that will help you learn to spot the danger in time, turn on your inner mobilization mechanisms, control your fear and adrenaline rush in a dangerous situation, use the opponent’s strength against him, not relying just on your physical capability, or get a refund (check our 100% guarantee), if for some reason this training video doesn’t suit you. You have nothing to lose. Your only disadvantage is to “leave empty handed”.